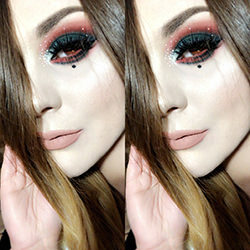 This blog, www.bowsandcurtseys.com, is a personal makeup and beauty blog that features make up looks, ideas, tutorials and product reviews that is written and edited by me. For any questions about this blog or inquiries, please contact me at bowsandcurtseys@gmail.com. All photos on this blog are taken and edited by myself. If any other photos are on this blog that are not of me, or taken/edited by me, I will state it and leave proper credit and sources. This blog is PR friendly. I will and do accept and keep free products, services, travel, event tickets, etc, that relates to this blog. If I feel a certain product worthy of being on this blog, I will exchange for a honest review, whether it is a positive or negative one; although it is not guaranteed that I will do so. If a post/look/review contains products that were sent to me for free, I will state it in the specific blog post. I am not compensated to provide opinion on products, services, websites and various other topics, unless stated. However, some links may be affiliate links. If that is the case, it will be stated within the blog post(s). The views and opinions expressed on this blog are purely my own and are 100% honest and unbiased. If I claim or appear to be an expert on a certain topic or product, I am expressing my own personal experience with the product and/or company. I will only endorse products or services that I believe, based on my expertise, are worthy of such endorsement. Any product claim, statistic, quote or other representation about a product or service should be verified with the manufacturer or provider. Since it costs me money to maintain this blog (domain, bandwidth products, camera equipment, etc) I have chosen to place ads on this blog. All advertising is in the form of advertisements generated by a third party ad network (Google Adsense). Those advertisements will be identified as paid advertisements. Comments are open to anyone and everyone. Any comments that do not relate to this blog will be marked as spam and removed. Any comments left by anyone other than myself do not reflect me or my blog.